Vertically cooked meat takes less time to cook. Almost set it an forget it cooking. Out of 497 reviews on Amazon, 93% gave it a 5 star. Hard to find any thing wrong with this cooker. 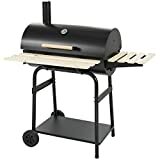 If you are interested in smoking, this cooker would be hard to beat for the price. Ideal for the beginner as it is easy to use. The Pit Barrel Cooker is a basic Ugly Drum Smoker. The Ugly Drum Smoker is the name given to a 55 gallon smoker made by a do-it-yourself griller. 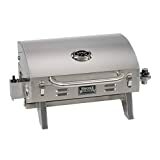 “This charcoal burning, 30 gallon steel drum with a lid on top and a small hole on the bottom is one of the more impressive cookers we’ve tested.” according to AmazingRibs.com. 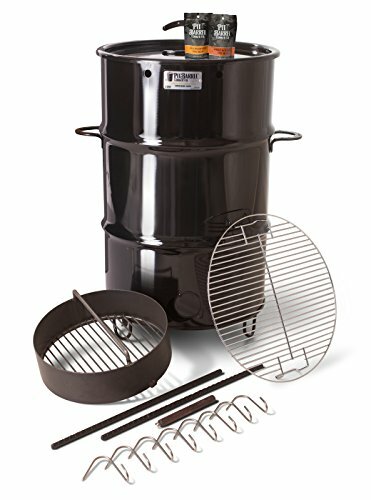 The Pit Barrel Cooker can be used for grilling, BBQ or smoking. It has a rack for grilling or hooks for cooking vertically. Brand: Pit Barrel Cooker Co.